From the Local Candidates Committee, to Civic Conversations and the Annual Dinner, members are involved in the work of good government. Are you looking for an insider’s knowledge of New York City and State politics and government? 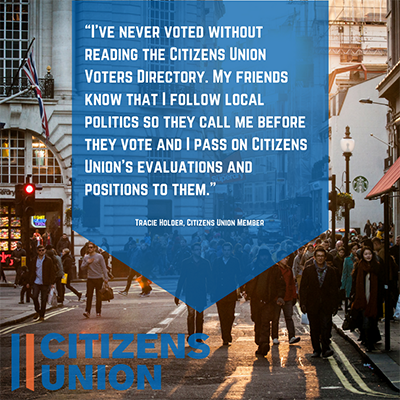 Citizens Union is your go-to source for what’s happening with your city and state government. As a Member of Citizens Union, we promise to keep you informed about critical issues—from Albany corruption to City Council discretionary funding to police oversight. We’ll let you know what’s happening, why it matters to you, and what Citizens Union is doing to help. We can also give you a leg up on Election Day, as our Local Candidates Committee untangles the many issues and candidate positions to deliver a guide with preferred candidates and positions. Want to get more involved? Apply (after joining as a member) to serve on one of our committees, which develop policy positions and inform candidate evaluations and preferences. The $30 annual membership fee comes with perks (free entrance to Citizens Union events, the ability to join a committee) but the most important component of membership is the act of joining a group of fellow New Yorkers who, like you, feel dedicated to ensuring that average citizens have as much influence on their government as lobbyists and special interests.